Active is a word often used to describe Lauren Whomsley. The Florida native loved the outdoors. When she wasn’t walking or biking on the beach, she was running five to seven miles a day. Vacations were spent fly fishing or hiking in the Rockies. But over the years, Whomsley’s knees started to ache. She was diagnosed with osteoarthritis, which occurs when cartilage in joints wears down over time. The pain, caused by bone rubbing on bone, started out as a minor irritant but grew to impact her ability to do the things she loved. “I’d try to run through it, but it just got to a point where I couldn’t do it anymore,” she recalls. Errands became increasingly difficult. “I couldn’t plan anything — even a trip to the grocery store — because I didn’t know how far I could walk. Everything revolved around my knee pain,” she says. In fall 2009, Whomsley, then 52 and living in Jacksonville, Fla., sought help from a local orthopedic practice but was unable to find long-term relief. 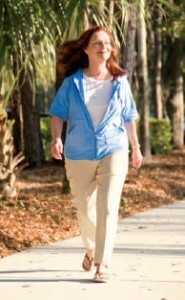 Physicians told her that a knee replacement was her best option. But the surgery — traditionally an invasive procedure with a long recovery time — would mean Whomsley would have to give up her active lifestyle for good. That wasn’t her idea of living, so Whomsley sought other options and was referred to Mayo Clinic. In September 2010, Whomsley met with Cedric Ortiguera, M.D., a Mayo Clinic orthopedic surgeon, who recommended a robot-assisted partial knee replacement. Using a new robotic arm system — the only one of its kind in northeast Florida — surgeons replace a small area of the knee with an implant, while preserving much more of the knee than was possible previously. “This device allows us to be precise in removing as little bone as feasible, replacing it with a small implant that mimics the healthy knee surface,” says Mary O’Connor, M.D., another Mayo Clinic orthopedic surgeon who uses the robot. The procedure is an excellent option for patients in their 50s and 60s who are experiencing knee pain due to athletic overuse or arthritis and have a limited amount of arthritis in their knee, says Dr. O’Connor. Older patients typically have arthritis throughout the knee and a full or total knee replacement is the better operation for such patients. Osteoarthritis can lead to more widespread degenerative knee disease over time, says Dr. Ortiguera, but one benefit of the robot-assisted procedure is that patients still have options if the disease progresses. “I was at a point where I was ready to do almost anything to get my quality of life back,” says Whomsley, who underwent surgery in November and was planning her next hiking trip two months later. “I’m very fortunate that I had access to Mayo Clinic — to the top physicians and the newest and best technologies — right here in my backyard,” says Whomsley. “I only wish I had known sooner.